Lighting-Gallery-net - Christmas Lights/Woolworth's Twinkling 80 Set Christmas light set. Woolworth's Twinkling 80 Set Christmas light set. I went up to my loft today and went through all the Christmas lights in the bungalow, I missed this set out of the main photo, This set was bought back way in 2003 I thinks From Woolworth's Still works fine now, i think over the years 2 bulbs have blown, but as you can see top of the screen i have a spare bulbs to stick in. The Blue and Red bulbs Flicker on off Twinkling. 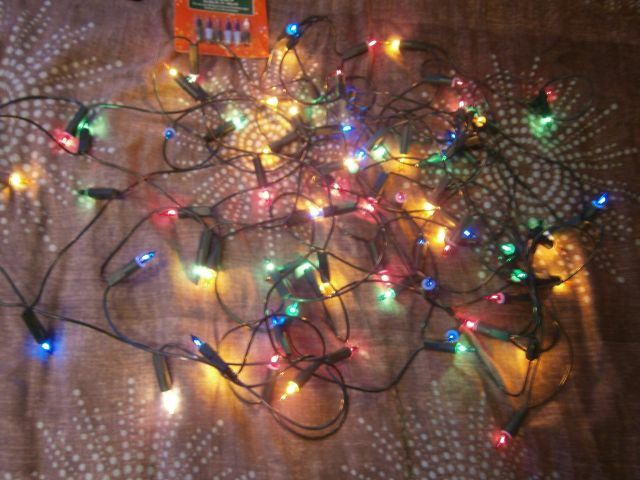 Personally i hate these Series type of Xmas lights cos if one of the Bulbs blows ya have to test them all untill ya find which one it is... And normally its the last one ya test! Also i hate these ones because if they become Tangled they are a pain to untangle lol! @ danny Actually if one bulb blows they all stay on I've fixed 2 in the years quite a reliable set, i think its because in each bulb there's the extra bit of metal in series type ^^ VIDEO OF THEM UP VERY SOON. very common series strings in USA. i have a 5 gallon bucket of tested bulbs. what i do is i pull all the bulbs out and replace them. and test them later. but if i am on the roof or the tree then i get my volt meter out to pinpoint where to start trouble shooting the string. just stick one lead in the ground and use other it as a probe.but if it the common string that dont light and the fuse checked out. i scrap it. since i get plenty of strings on city curb finds. and i keep chaser lights since there more expensive to get. broken wire no problem. have replacement wire and i use a kitchen fork to pop the contact out between the two lamp socket to replace the broken wire. All of our minature lamp strings are series with little shunt wires that are supposed to fuse when the lamp burns out. Seems like the quality has slipped quite a bit in the last 10 years or so, as they have been unreliable lately. Well, this year I've got a new trick...a new multimeter with a non contact sensor for live wires. Just make sure the line with all the lamps is on the hot side of the outlet and just follow the string until it stops beeping. Yer most of these sets i have have the fuse wire between the pins and filaments to keep all other lights on Evan the old Miniature screw bulbs do. The downside is that the working lamps will have a higher voltage over them when one has failed, so they fail faster (and this process accelerates as more bulbs fail) if the bad ones aren't replaced.